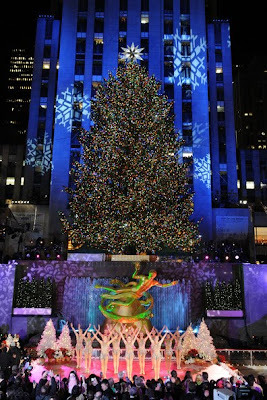 For some people it's Thanksgiving, for others it's Black Friday, for me the Tree Lighting at Rockefeller Center is the official start of the Holiday Season. And tonight is the night my jet setters! The hoopla leading up to the tree lighting starts at 6:45 pm, but the actual lighting happens at 8:55pm sharp! I won't be there live (rather on my couch at home where it's warm and not crowded), but it's on the agenda of things to do and see when our good friends from Dallas, Texas come into town this month. They got a weekend flight into New York for $150pp round trip- so there are good deals out there if you want to jet set to New York for the holidays. (Just email me and I can help you find them.) Going to see the tree, checking out the windows at Saks Fifth Avenue, maybe a little ice skating at the rink, and then heading to The City Bakery, Jacques Torres Chocolate Haven, Vosges Haut-Chocolat or Lunettes et Chocolat for some delicious hot cocoa afterwards is a great agenda to me for a date night, or a night out with friends in New York City during the holidays! Lori the @SQC site says it is closed now. Brian...good catch! You are absolutely right about @SQC site being closed. I guess these days more and more places are closing all of the time. That's too bad, it was a good place, but there are still a bunch more that are good for a hot cocoa. If you go to any or know of any more that I didn't mention, please share with us jet setters! Thanks!